Josh Worth's If the Moon Were Only 1 Pixel is a scaled model of the Solar System. The model takes you on a 5,906,510,212 km journey from the sun out as far as Pluto. Luckily for us in this model each pixel is 3474.8 km, so we can cut down the journey time a little. If you haven't got the time to travel to Pluto today then perhaps I can interest you instead in a quick journey to Mars. How Far is it to Mars? works on a similar principal to If the Moon Were Only 1 Pixel. 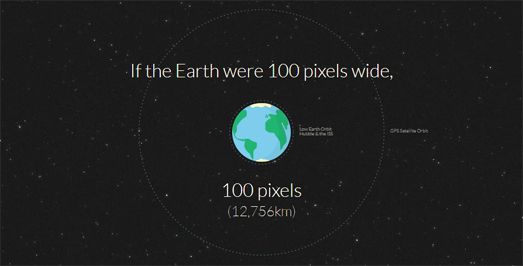 However on this journey the Earth is 1 hundred pixels wide and the Solar System is scaled appropriately. We also don't need to travel quite as far. If you click on the down arrow you will travel at an equivalent speed of three times the speed of light. A real journey to Mars would take around five to seven months from Earth. Luckily at this scale and at the equivalent of 3x light speed we can make the journey in just a few seconds. If you've been to Mars and back then I have another trip that you might want to try. Come with me now on a Journey to the Centre of the Earth. Through the porthole on your right you can observe the Gutenberg Discontinuity, as we slowly pass through the Earth's Lower Mantle into the Outer Core. The slight discomfort that you feel at this depth is caused by the 1.35 million atmospheres, which is roughly equivalent to 17,800 elephants standing on your head. If you survive those elephants then during your journey you are presented with a series of interesting facts about what you can find as you get closer to the center of the Earth. One thing to keep in mind as you scroll down the page is the shifting scale used in the visualization. A display at the bottom of the screen updates with the current scale and a handy guide to the distance traveled. Now for the big one. We've traveled to the centre of the Earth and out as far as Pluto. Now it's time to take a journey into outer space with How Big is Space. How Big is Space takes you on a journey from Earth to the very edge of the solar system. As you scroll down the page you will leave Earth's atmosphere, pass the planets and the Kuiper Belt before passing Voyager 1 & 2 on your journey to the outer edges of our solar system. As in the Journey to the Centre of the Earth the How Big is Space visualization uses a shifting scale. A display at the bottom of the screen updates with the current scale and a handy guide to the distance traveled. Do You Speak the Queen's English? Who Won the Super Bowl of Google Search?